I think these technologies will boom up in a near future with dynamic range camera (DRC). Most of the time, this isn’t an issue for robots (or people), because we’re not attempting (or observing) high-speed maneuvers. But flying robots that aremoving at very high speeds need a better solution to keep track of where they are, since it’s hard to keep track of your environment when your camera is telling you that everything around you is one giant smear of pixels. 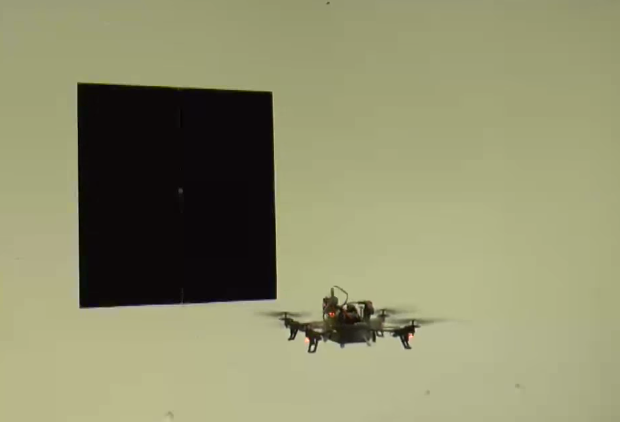 The spatial resolution of the camera used on the robot (a modified AR Drone, if you’re wondering) is only 128×128 pixels, but its temporal resolution is in single-digit microseconds. The OptiTrack cameras you see up on the walls were just used for recording ground truth data. Over 25 trials, the DVS and control system accurately tracked the robot 24 times, for an overall accuracy of 96 percent. Not bad. This entry was posted in Hardware, Sensor and tagged DVS, fast sensor, Quadrotor on October 8, 2014 by enddl22.